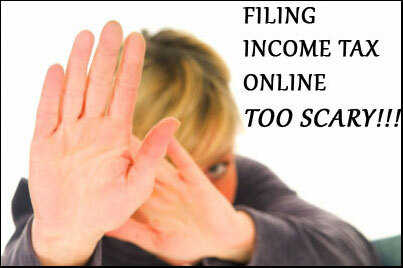 You are here: Home / Newcomers / Is Filing Income Tax Online Too Scary To Even Try? It is like watching a scary movie—filing income tax online in Canada. I imagine people having goose bump with their eyes covered with one hand and the other grabbing the now-rumpled clothes of the unfortunate fellow sitting nearby. I suppose my imagination is not too far from reality. Every time I dare to ask someone I know if they are going to file income tax return online—all I hear is a resounding NO. What an annoying word. Maybe is better. Or is it possible? Anything, beside a word giving a negative connotation towards the electronic method in filing an income tax return. Maybe all we need is a little encouragement. Processing time of 4 to 6 weeks, now takes only less than 2 weeks. All you need is your social insurance number and date of birth to complete the online filing. It seems appealing enough for me to try. I’m guessing the CRA is wishing that majority of the taxpayers will prefer filing income tax online but will allow the traditional mailing of forms. Remember the date: February 11; you can access the NETFILE and start submitting. It seems like a premier night of the much-awaited movie. I don’t want to be at the end of the line. Some may have phobia towards anything associated with the Internet and perhaps the electronic method is just too techie for a newbie to try. If those who dare to try can teach others, then, maybe next year more will heed the advice of Canada Revenue Agency. For skeptics the approach of CRA may not work. If in every change, the government will have to send a letter, imagine the waste of time and paper. Maybe it’s not yet time. Is filing income tax online your preferred method? Whatever you choose, don’t forget to file on time. Imagining if I missed the filing date, I’ll be screaming like the person in a theater watching a scary movie that is about to end, with a gruesome ending—no one survived the curse. But not in filing income tax return. I’ll be dancing like Happy Feet. « Flashback, How Do I Feel Leaving Home?